In the past I have used first vim-latex for compiling my LaTeX projects. And later on I discovered vim-latexsuite, which amazed me because of forward searching and backward searching which were totally new to me. Then the config stopped working for me when I updated vim. Searching the famous LaTeX plugins for vim, I’ve discovered vimtex by Karl Yngve Lervåg. 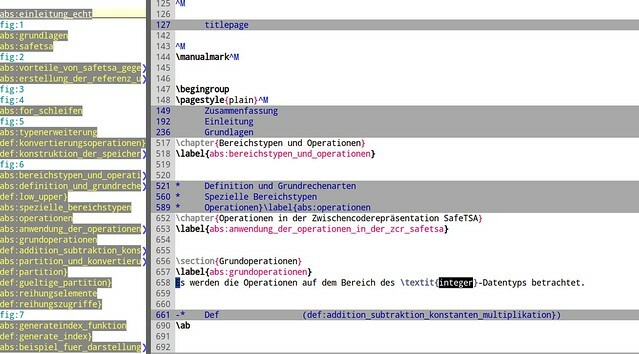 At first I was happy that it easily compiled my latex documents with \ll as well as opening the generated pdf with \lv. I wanted more, I wanted my forward and backward searching back. Think of bibtex or your toc - everytime you have to run pdflatex several times to update the entries. 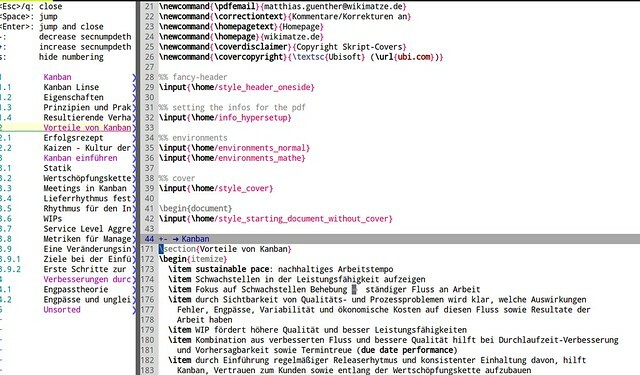 Vimtex uses latexmk to compile the LaTeX document. latexmk is a perl script that runs the desired/necessary LaTeX command the correct number of times to resolve cross references. The version of latexmk in the Ubuntu repositories is old (2012). I therefore suggest to remove it with sudo apt-get remove latexmk and then instead grab the latest version. Normally, you don’t have to create a custom latexmkrc because Vimtex does all the magic for your like adding the synctex option or specifying the output with -pdf - all of this is automatically done by the plugin. Latexmk: This is Latexmk, John Collins, 22 April 2016, version: 4.45. Babel <3.9h> and hyphenation patterns for 7 languages loaded. Output written on kanban.pdf (16 pages, 141131 bytes). Output written on kanban.pdf (16 pages, 141117 bytes). The synctex option is needed for forward/backward search. linsynctex1 is needed for libsynctex-dev. I’ve decided to use zathura as my default pdfviewer because of it’s vim bindings. make: Nothing to be done for `man'. And look if you can find -I/usr/include/synctex. Please note that girara is needed for the zathura version 0.3.6. If you just want to see the plain generated pdf, it’s nearly everything you need. If one uses gvim or similar, then the client-server is automatically enabled. Backward search can be easily triggered if you just press <C-Enter> on the PDF and you jump right to the place in the terminal. This should work automatically with zathura, but it is also the only viewer where this will work automatically. In general, backward search should be configured on the viewer end. Luckily, vimtex may parse command line arguments that does this for zathura. Combined with the vi-keys in zathura, this is one of the main reasons I prefer zathura. :VimtexCountWords|:VimtexCountLetters: count the number of words/letters in the document. It will also show the number of math environments, and similar. :VimtexLabelsOpen|:VimtexLabelsToggle: open table of labels. :VimtexErrors: open quickfix window if there are errors or warnings. :VimtexClean: clean auxilliary files like *.aux, *.out, and so on files. Use :VimtexClean! to remove everything, including the generated pfd file.